People seem really worried about a bubble in stocks. What do they recommend? That the Fed raise rates now to pop the bubble. Recently Ben Bernanke has weighed in on whether monetary policy is the right tool to correct for financial imbalances. Scott Sumner has a nice reply on how the Fed’s popping the stock market bubble in the 1920’s led to the Great Depression and possibly even World War II. This has been rehashed enough that I won’t go into it much. Suffice to say that whenever the Fed tries to pop a bubble (stock market in 1929, housing in 2008), the results have been a major economic meltdown. The Fed should focus on macroeconomic targets like nominal GDP growth and leave stock market and housing prices to their own devices. To address concerns we’re currently in a massive stock market bubble, there’s a huge difference between the irrational expectations of corporate earnings growth in the late 1990’s and the high P/E ratios we see today. Stock valuations today are high historically. That makes corporate earnings yields particularly low. But the benchmark by which to judge corporate earnings yields is the risk-free rate of return. In the graph below, I use 10-year treasury yields. First of all, forget the years before 1960. With the Great Depression, World War II, Korean War inflation, etc., economic growth was extremely volatile. Also, markets were far less efficient and information far less available to your average investor. Since 1960, we have a better model of what happens to P/E ratios as interest rates change. Interest rates rise, P/E ratios go down. Investors expect more yield when treasuries pay out more. 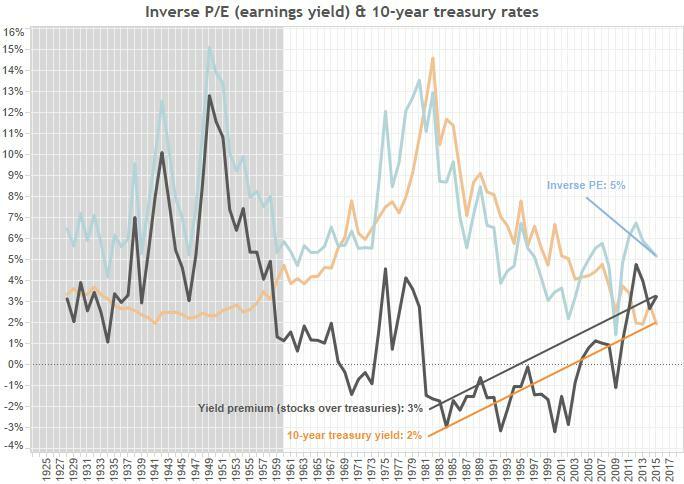 Now P/E looks historically high (the inverse is low), but interest rates are low too. By taking the difference between corporate earnings yield & interest rates, we see that there are long stretches in recent time where the yields from treasures were higher than the earnings yield off the S&P 500. This seems crazy. If we’re pricing some risk into stocks over treasuries, we would expect inverse P/E to be higher than treasuries. What gives? Well, as the Fed allowed rates to rise, compressing inflation down to its 2% target, equities rose as did P/E ratios. That pushed corporate earnings yields below treasuries because of the ongoing price adjustment. Investors were happy to take the lower yield because they knew inflation was headed towards 2%. Not only that, but corporate earnings should rise every year with nominal GDP. So a 5% yield this year could be 7% next year, 9% the year after. Treasury yields aren’t growing in the same way. Where are we now? With inverse P/E showing expected corporate earnings yield at 5%, treasuries around 2%, our premium for owning stocks works out to 3%. Historically, this isn’t a bad place to be. It makes complete rational sense to hold S&P 500 stocks at current valuations and current expectations of interest rates / inflation. There is no bubble to pop, and investors should take heart that stocks still have room to grow as interest rates will likely be stuck very low for a very long time. In fact, if the economy keeps puttering along at current rates of growth, and interest rates do stay historically low for a long time, stocks would have to adjust a lot upwards to reach fair value. So please don’t freak out about financial instability or irrational exuberance. We’re all behaving quite rationally given the times in which we live.